The “which is the best concealed carry gun?” question often leads to a “revolver versus semi-auto” discussion. Those who are revolver only fans traditionally use the “semi-automatics tend to jam” reasoning for their affection. As someone who owns and enjoys both of these types of handguns, I have to add a bit of defense to the argument that semi-autos jam. I’m not here today to engage in the debate as to which is tangerine is better than which orange. What I am here to share is why some people have struggles with handgun jamming. Also see: Shooting Tips: Should I shoot with one eye or two? Just because we pass a background check and legally purchase a firearm doesn’t mean we know how to operate it. First and foremost, a shooter should take an accredited pistol course. If you’ve been shooting handguns since you were a youngster, like me, I promise it doesn’t hurt you one bit to take handgun course. A refresher will do you good. Be open to learning new things. You may have missed something as a youngster, and most youngsters don't learn techniques like fighting or competing with handguns. Learning a proper shooting stance and then creating muscle memory is important to being proficient with your pistol. Bend at the hips, with your weight forward, in a ready position. If you’ve got your weight back, you’re defeating the design of the firearm. A bad stance increases the risk of slide malfunction. For a semi-automatic handgun function correctly, it needs a solid support. This keeps the frame still, which allows the slide to move. A correct grip is essential to accuracy in both single shot and multiple shot scenarios. It’s also essential for proper slide operation of semi-auto handguns. The grasp with your hands should be firm. Your wrists should be straight. Arms should be extended ahead of you, in an isosceles position. The hands and arms form a horizontal line behind the grip. 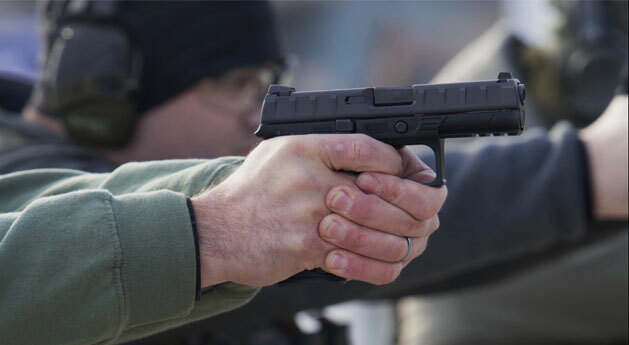 This shooting position creates a strong backstop for semi-automatic pistol recoil. When recoil isn’t directed in a horizontal plane, the recoil energy is directed away from the slide spring. The spring will not have a backstop and, therefore, won’t develop its full potential for return energy. This can cause the slide to rebound too slowly, creating a jam. The ready stance with isosceles grip directs the recoil energy straight back, through the wrists, elbows, shoulders and becomes grounded by the forward ready stance. It allows the shooter to absorb recoil as a lightening rod pulls electricity. This phenomenon keeps the muzzle on target. In other words, a shooter can acquire his target more rapidly than someone using other methods. It also allows the recoil energy to bounce straight back, through the shoulders, elbows and wrists to the internal spring. This chain reaction and rebound cause the slide to slam shut. If a shooter limp wrists during a shot, he or she diverts the energy from being rebounded properly, potentially causing the firearm to jam. Similarly, if a shooter straight-arms the shot, it may divert the recoil energy and can cause the handgun to jam. Another popular cause of semi-automatic malfunction is the lack of maintenance. The timeframe between cleanings varies depending on how much range time you give the pistol, what type of ammo you use and what lubricant you apply. A dirty or improperly oiled slide simply won’t move freely. Compact handguns have smaller springs, smaller slides, and smaller grips, yet the energy of any given cartridge is the same. If you cannot properly grip the firearm, you cannot provide the backstop behind it to absorb the recoil. Remember, if the recoil process doesn't complete properly, the spring and slide won't be able to do their jobs. These compact models require a good grip to prevent malfunctions. Larger caliber semi-auto handguns have their considerations too. A larger grip may be easier to grasp, but depending on the caliber and model, it may also have a larger, heavier spring, which will necessitate an extremely strong backstop. Refer back to shooting stance and grip, above. If you don’t learn how to properly use your firearm, it’s not going to do you any good in an intense emergency situation. If you forget how to grip or stand while shooting, you’re doing your pistol no justice. You have got to practice with your pistol on a regular basis. You have got to learn how to care for your handgun. You’ve got to learn to minimize the risk of malfunctions by using proper technique.